Seal singer Scars,his Children,Unseen mum,Heidi and Erica Packer. 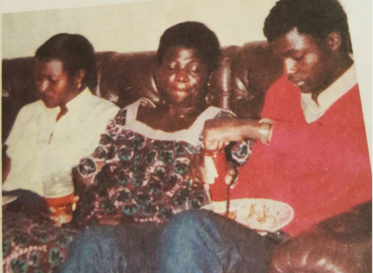 Singer Seal the Grammy award winner with the big song Kiss from a rose is seen in a throwback picture here with his mother in Lagos Nigeria. 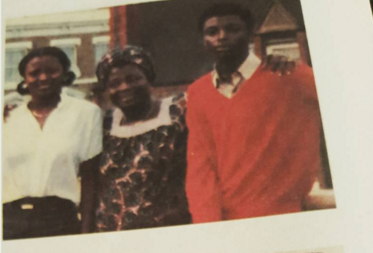 Olusegun Adeola Akanbi Olumide Samuel,born on Feb 19 1963, SEAL, is pictured with his late mother, Mrs Adebisi Anthonia Samuel and sister Mrs Olufunmilola Aramide Adebowale in Lagos Nigeria many years ago. alleged Seal was angry with his mother cos he felt he had been tricked to leave for Nigeria from London where he was born. Sad story especially seeing from this picture clearly that Seal was a spitting image of his mother.The first picture in particular is spooky.RIP Mrs Adebisi Samuel. Singer Seal scars.Another thing Seal is famous for are the scars on his face.There have been so many rumours concerning them.The most prevalent one is the one that says he tried to remove his tribal marks and they became scarred while infected. Well,that sounds like a great story.But its not true.The singer actually suffers from a condition from a type of lupus that is called discoid lupus erythematosus. It affects the skin above the neck and is a chronic skin condition of sores with inflammation. The Grammy award winner Seal developed this rare form of lupus and his face became scarred by the time he was 23 years old.But it didn't hold him back from becoming one of the biggest stars in the world and dating some of the most famous women in the world.The singer stands at an imposing 6 ft 3 in height,dark and finely built with muscles,i guess that is enough to make all those women out there melt and his unusual manly looks. Seal and Heidi Klum who he was married to and now divorced from. Seal was famously married to the German supermodel Heidi Klum.They got divorced a few years ago but remain friends for the sake of their children.They started dating after her relationship with Italian Formula One team manager Flavio Briatore ended. Seal Musician children.Klum gave birth to Briatore's daughter, Helene "Leni" Boshoven Klum on 5 May 2004 in New York City with Seal at her side. According to Klum, Briatore is not involved in Leni's life, and Klum has stated emphatically that "Seal is Leni's father". Seal is her only father figure and he has praised Briatore for keeping his distance and not disrupting Leni's life. In late 2009 Seal officially adopted Leni, and her last name was changed to Samuel. The couple have three other children: sons Henry Günther Adeola Dashtu Samuel (born 12 September 2005), Johan Riley Fyodor Taiwo Samuel (born 22 November 2006) and daughter Lou Sulola Samuel (born 9 October 2009). On 22 January 2012, Seal and Klum announced that they were separating after nearly seven years of marriage. Klum filed for divorce from Seal on April 6, 2012. She also requested that her name be restored to her birth name of Heidi Klum. He is now dating another stunner Erica Packer,not bad is it? His break came when he met the producer Adamski. He was given the lyrics of the song "Killer", which was a huge hit in 1990. Seal mom Photo credit: Dele Momoduovation. I am a BIG FAN of Seal_from South Africa,I am DIGGYDOWN DIGGER DeLORENZO. Would be glad to meet my Superstar in person before each one of us could pass on!